NOTES: Short run with resin and photoetched parts. Clear injected canopy. 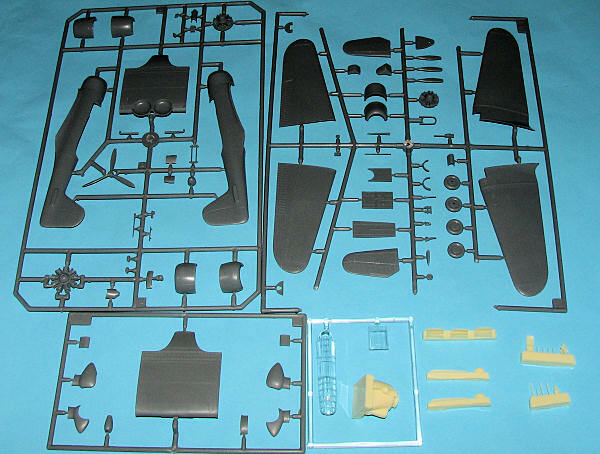 The two variations of the Model 8 in this kit are the Model 8A-2, a version for Argentina. Fitted with fixed undercarriage, ventral gun position and powered by 840 hp (626 kW) Wright R-1820-G3 Cyclone. 30 built. 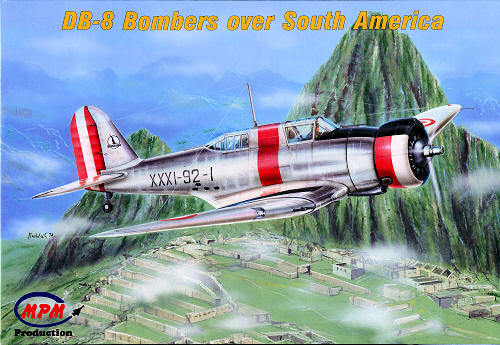 The other is thet Model 8A-3P version of the A-17A built for Peru. Powered by the 1,000 hp (746kW) R-1820. 10 built and used in the war with Ecuador in 1941. Later supplemented by the Model 8A-4N with the 1,200 hp R-1830 as built for Norway. 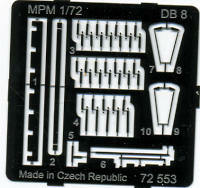 This is not, of course, the first time MPM and other branches of the company have produced this particular kit. It initially saw the light of day as theNorthrop A-17 kit and has been produced as the A-17A and a batch of Douglas DB-8 kits. This one seems to have all the bits and pieces from all of the various boxings tossed into one box. You get both fixed and retracting gear and their required center wing sections. You also get three different engine and cowling options as well as a resin firewall plug (which you may need on this variant. Now you aren't going to need all this stuff, but depending on which version you build, you will use quite a lot of it. Naturally, you get a photo etch fret for control actuating arms, gunsights and bits to go along with the center fuselage bomb racks. These racks are in resin along with a new firewall piece, a scoop, guns, prop hub and some other small pieces. There is a clear one-piece canopy and what looks like a lower rear gun position. Molding is still quite good. The aircraft has some interior detailing along the fuselage walls with an acceptable pilot and gunner's position. A five piece wing with a separate center section as well as upper and lower wing halves. There is enough of a stagger to allow for overlap of the wing halves and center section, making for a strong and fairly good join. The Peruvian plane has the retractable landing gear while the Argentine plane has fixed gear, lower gun position and the resin firewall section. Instructions are well done and specify which bits go with which camo scheme. Colors are Humbrol and generic references. Markings are for three Peruvian planes, all in basically the same scheme of unpainted metal and large colorful insignia. There are differences in bands and markings placement amongst the three. 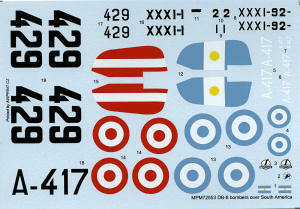 The other two are Argentine planes. One is in unpainted metal with large aircraft numbers. The other is a camouflaged plane from during WWII in Dark Green over Light Blue. Decals are very nicely printed by Aviprint and should work superbly. Always nice to see interwar aircraft like this. This may well be the final boxing of these as the MPM crowd has done quite a few, but one never can tell. It is a nice kit and though it has some rather fiddly bits in PE and resin, it should build into a very nice model.